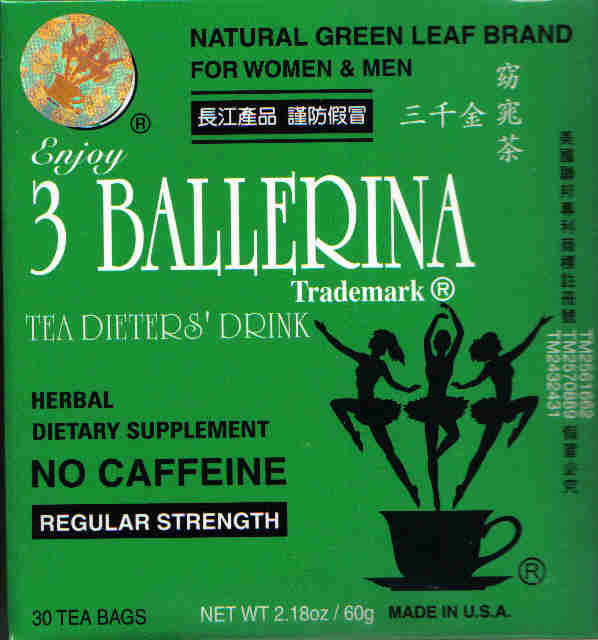 3 Ballerina Tea is a green tea. Although it is promoted as a weight loss product, weight loss is a side effect of its real function as a diuretic and laxative. Its natural ingredients detoxify the body, and because of the tea resulting fast colon-cleansing action, more calories are often burned than consumed. The weight lost by drinking this tea is mostly water weight. Malva Verticellata (Chinese Mallow), Cassia Angustifolia (Senna). Extra bowel movements may be expected in the use of 1st or 2nd day after using this tea. 3 Ballerina Tea relieves constipation, irritable bowel syndrome and other gastric discomforts such as bloating, gas, and distended stomach. No chemical additives or caffeine. 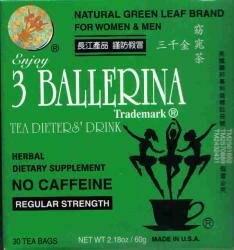 Because 3 Ballerina Tea is a purgative, weight loss is a byproduct of its laxative and diuretic effects. This product contains Malva Verticellata (Chinese Mallow) and Cassia Angustifolia (Senna) herbs. Read and follow directions carefully. Pregnant and nursing women, children, the elderly and individuals suffering from any illness or health condition should not consume this tea. 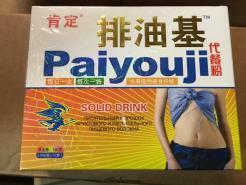 Do not use this tea if you have or develop diarrhea, loose stools or abdominal pain. Consumers are urged to consult a licensed physician prior to using this or any herbal supplement. I drink it every day for the last 2 months and helps me lose weight in a easy way. I just take 2 or 3 cups a day. I am not a big fan of teas, but since my sister give me this tea, I feel great, more energy and less weight.